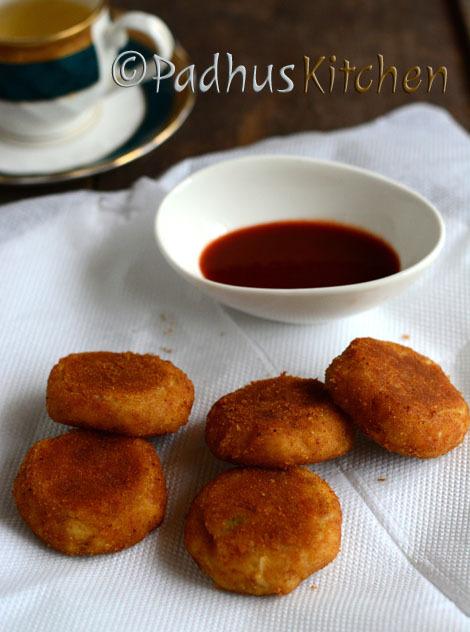 Paneer Cutlet is a quick and easy snack made with grated/crumbled paneer, spices and bread. It can be had with tea or can be given to kids as after school snacks. It is very soft on the inside and crispy on the outside. Today we will learn how to make delicious Paneer Bread Cutlet (without potatoes) following this easy recipe with step wise pictures. In a bowl mix together paneer, bread (cut the brown edges of the bread and tear it into small pieces), ginger-garlic paste, green chilli, salt and pepper powder. Mix well with your hands. Add thick curd and mix well to form a dough. Divide the mixture into six equal parts, make smooth balls and then flatten it to make patties (disc). Mix cornflour with a little water to make a slightly thick paste. Keep bread crumbs ready. Dip the patty in cornflour + water mix and then coat it with bread crumbs on all the sides. Repeat the same for the rest of the patties. Now all the patties are coated with bread crumbs and kept ready. Heat 3 tsp of oil in a pan and place the patties. Drizzle a tsp of oil around all the patties. Shallow fry on low heat (you need a lot of patience for this) until golden brown. Delicious paneer cutlet is ready. Serve hot with ketchup or green chutney. Enjoy with tea or coffee. Note - You can use store bought paneer or make paneer at home. Yummy..! Taste s too gud.. Ma hubby jz luvd it... Thanks a lot ..